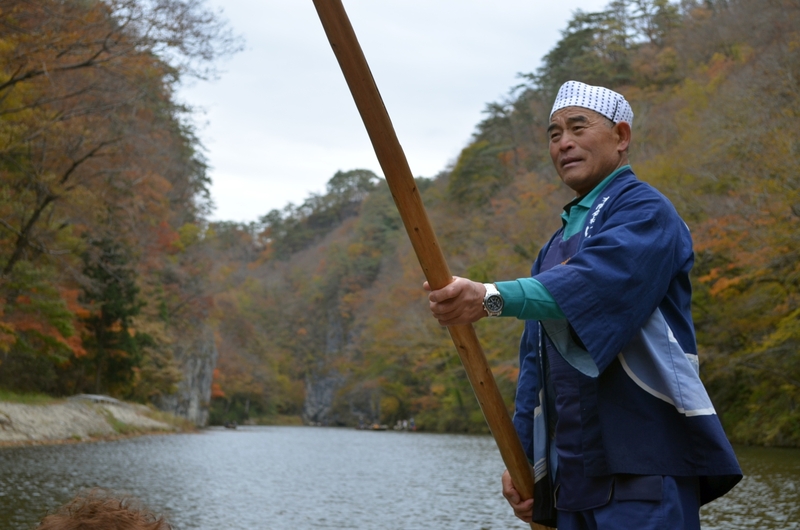 Travel to Iwate may be off the beaten path for most travelers coming to Japan who are much more familiar with the mega-cities Japan is known for, but with its rural vibe and abundant sights steeped in history, there’s no question Iwate should be a part of any visitor’s trip to the country. Chances are, if you were to tell most people you were off to go visit Iwate Prefecture in Japan, you would probably be met with a collective, “Huh?.” If you were to follow that up by explaining it was the part of Japan that was affected by the terrible tsunami in early 2011, then you would probably start to get some recognition. The best way to describe Iwate, especially if you were heading there deep in the fall season like we were, would be to say you were heading to the “New England of Japan.” The analogy is a bit forced, but at the very least, a mental picture of what you were about to experience would start to form. After a late night out at Robot Restaurant (you can read my Tokyo travel article here), we woke up early and took the express train from Shinjuku Station east to Tokyo Station, roughly a 20-minute trip. The day before we had bought a Japan Rail Pass (or JR Pass for short). If you’ve ever traveled Europe using the Eurail pass, then you’ll know how convenient it is to travel via an unlimited rail pass, which is essentially what the JR Pass is. Limited to non-Japanese, for a one-time fee you can buy a pass that will allow you to travel unlimited distances depending on the length of the pass (they offer 7-day, 14-day and 21-day passes). You simply flash the pass to the agent upon arrival at the station gate, and they will wave you in, no questions asked. Given Japan’s extensive rail system, you can get pretty much anywhere via the regular trains (Japan Railways) or the famed bullet trains (the Shinkansen). For us, we were taking the Shinkansen north to Iwate Prefecture (prefectures are essentially states or provinces in Japan — the country has 47 in all). Iwate is located in the far northeastern corner of the country and is actually the largest prefecture in the country (excluding the island of Hokkaido), but also its least densely populated (again, not including Hokkaido), which means lots of open space, rolling hills, small towns and a rural vibe not easily found in the rest of the country. 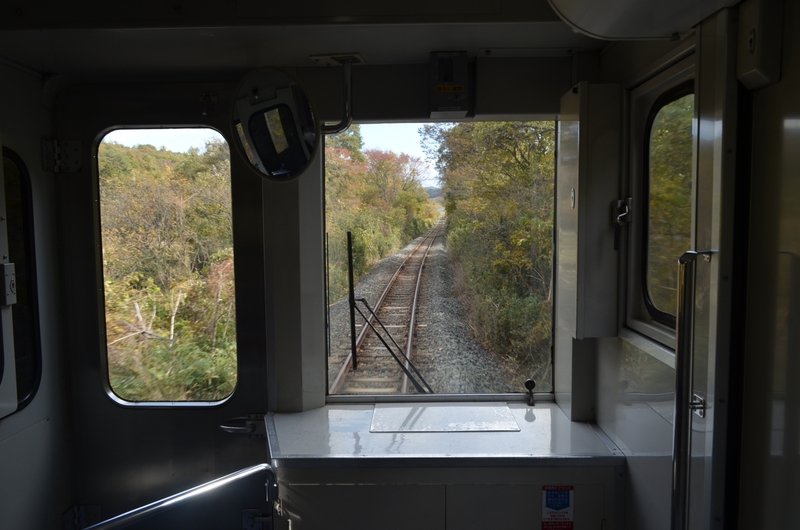 As soon as we got off the Shinkansen in Ichinoseki and transferred to the traditional train that snaked its way through the mountains to the town of Geibikei, I couldn’t help thinking how much the area felt like my past trips to New England in the fall. Outside our windows the Japanese horse-chestnuts, Japaneses maples and birch trees were burning brightly with vivid red and yellow colors, causing the evergreen red pines and Japanese cedars to emerge amongst their withering neighbors. After a hearty lunch of udon with mountain vegetables, mushrooms and egg at a small plaza just outside the train station in Geibikei, we made our way onto one of the flat, wooden boats at the entranceway to the Geibikei Gorge. 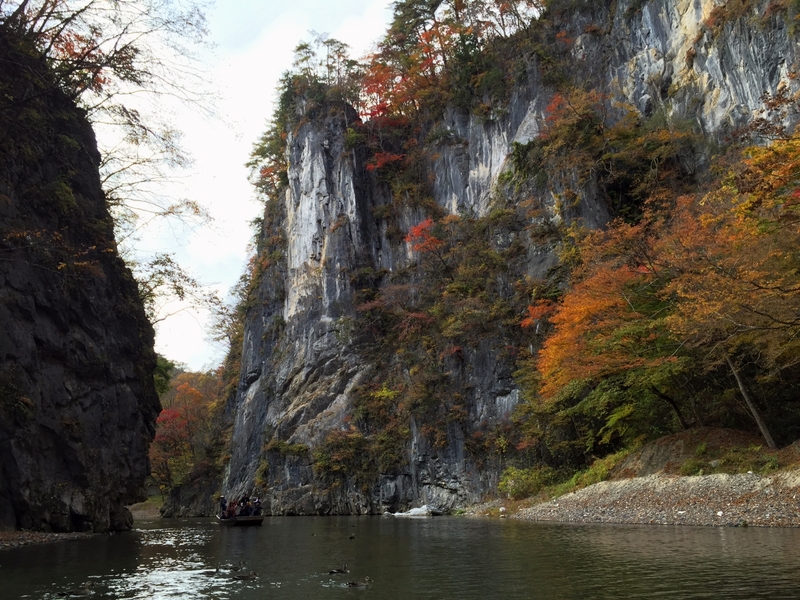 Our austere boat captain pushed us off the pier with his long wooden oar, and began to lead us along the steep cliffs that make up the gorge, a view that evokes the landscape images we are familiar with from traditional Asian artwork. Below us, schools of Koi fish followed along as we cruised the mile or so that makes up the main part of the gorge. Overhead, 160-foot-high cliffs towered over us and a cool, fall breeze blew through the narrow passageway and rustled the burnt orange, red and brown leaves creating a canopy above. Towards the end of the ride, as our boat captain broke into traditional song and the wind whipped up sending a shower of yellow leaves floating down upon us, it was hard for a moment to remember whether this was reality or perhaps the Robot Restaurant the night before had triggered some sort of psychedelic relapse rendering our perception off-kilter (luckily, it was the former). 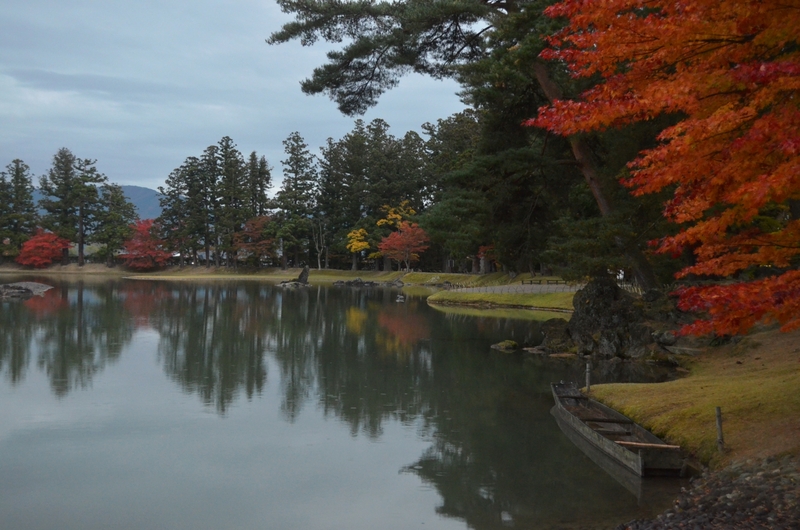 Iwate’s claim to fame is that its city of Hiraizumi was, for over 100 years beginning in 1087 A.D., one of Japan’s major capitals, and at the height of its power, home to upwards of 100,000 people, more than even the other major capital at the time, Kyoto. Today, the small town is home to less than 10,000, but the area is dotted with the remains of the former capital. 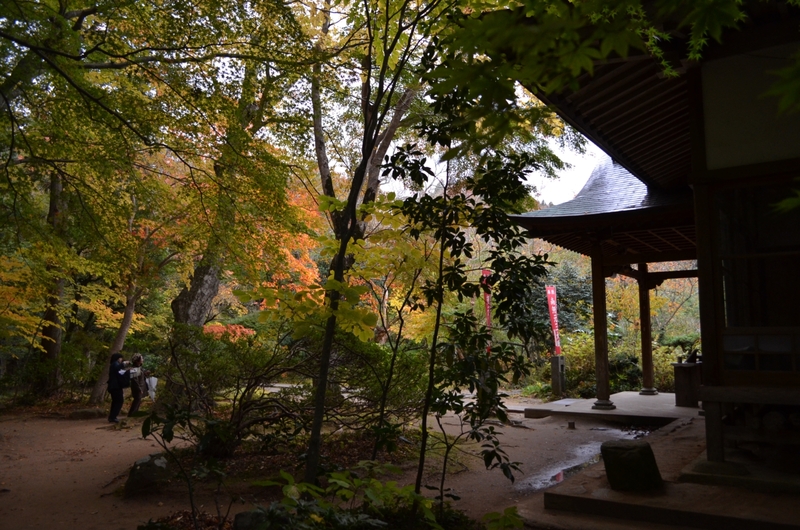 The most spectacular is Chūson-ji, which was a short train and taxi ride away from Geibikei. When we arrived a cold drizzle had begun to fall and the crisp air bit at our fingertips as we clutched our umbrellas, creating an atmospheric (quite literally) mood as we explored the sacred grounds. The area itself, now a UNESCO World Heritage Site, once comprised over 300 buildings and 40 temples at its peak, but the only remaining structure you can still see today is the Konjikidō Golden Hall, a spectacular wooden temple adorned with gold leaf across every inch of its body. Just inside the entranceway to the building housing the temple, a monk was diligently writing calligraphy on small strips of paper. A recording of chanting reverberated throughout the building and the mood inside as we made our way to the covered temple was solemn and reverential. Outside, you can walk the many paths throughout the wooded hilly area and explore the other structures there, including the Noh Theater, where traditional kabuki is still performed, the Sankōzō museum, where the most prized uncovered artifacts are on display, and the Hondō Main Hall, the complex’s primary temple, where ceremonies and rituals are still conducted on a daily basis. To finish out the day, we took a short taxi ride to visit Mōtsū-ji, Hiraizumi’s other major temple complex that once dominated the area. The complex was founded in 850 A.D., and at its peak, comprised roughly 40 halls and stupas and 500 monk quarters. Not to be outdone by nearby Chūson-Ji, Mōtsū-ji was said to have been larger and even more grand. Today, little remains of the actual buildings, but the main lake that served both a functional and spiritual purpose still remains, and an exploration of the grounds is a unique experience and provides an insight into what life was like here 1,000 years ago. We were staying at the Morioka Route Inn, a no-frills but extremely convenient “business hotel” mere steps from the train station that featured a well decked-out onsen on the top floor where I was able to take part in my first public bathing experience here in Japan. Having read up about the many steps that one must follow so as not to embarrass oneself while naked in the company of strangers, it was a relief to find that the only other bather in the onsen at the same time was wrapping things up (literally) just as I entered, so I had the place to myself (and where I’m pretty sure I still followed every procedure correctly). The next morning we loaded up into our taxi at the hotel. We were heading east to visit the coastline and to make our first stop at the Hashino Iron Mining and Smelting Site, a must-visit for anyone interested in understanding how the Japan of yesteryear became the Japan of today. Located high in the hills above the coastline, Hoshino was the site of the first Western-style blast furnace and helped usher in Japan as a modern industrial power in the 19th and 20th Centuries. Constructed in the 1850’s, the blast furnaces were based on Western innovations in iron production picked up by Oshima Takao, a samurai of the Morioka Clan, after traveling in Europe. Fueled by the abundance of nearby iron ore and plentiful trees to fuel the furnace, Takao’s innovations spread throughout the country and gave rise to modern Japan. Today, you can visit the site and learn more about the history and process of steel production, and as we did, you can explore the hilly grounds where the several furnaces and offices were located during the height of production. 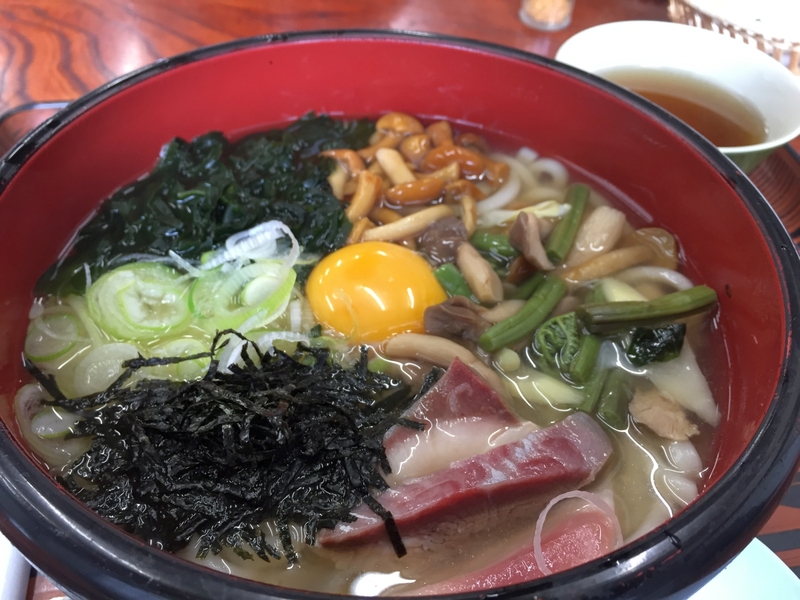 After visiting the site, we continued on to the seaside city of Kamaishi. Hit hard by the 2011 tsunami, the city has bounced back, and little of the destruction remains except for the sight of temporary housing set up near the center of town and the collective memories lodged in residents’ heads. This was made very evident to us when stopped for lunch at the Kamaishi Sea Plaza, an indoors shopping complex that is home to many displaced business owners whose original businesses were washed away. Many have now relocated to this indoor complex and are working hard to rebuild their lives. We opted for an indiscreet shop at the end of the building where we ordered lunch from a woman whose restaurant had been completely destroyed. What followed was one of the best seafood lunches I’ve had in a long time, all served out of a space one could easily be forgiven for thinking was nothing more than a small gift shop. Thankful for our visit, the owner/chef took pictures with us and was careful to make sure we had enjoyed our meal — a living embodiment of perseverance and humbleness in the face of forces greater than us. We took a short car ride to the nearby Iron and Steel Museum for a final tour of the region’s steel-making history. Inside is an immersive exhibit detailing the iron-making process and its history in the region, along with a number of artifacts from the remains of the original factories. 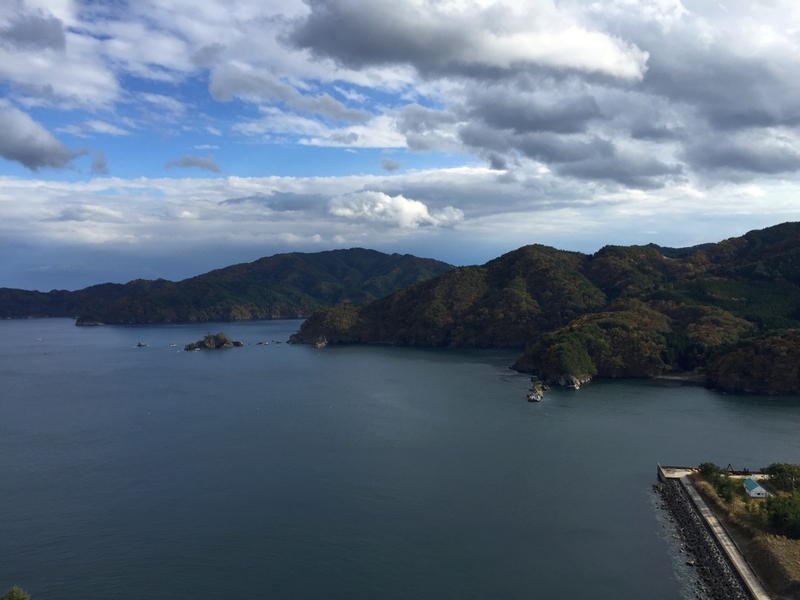 Then, in a fitting goodbye to the area, we walked to the nearby Kamaishi Daikannon Statue, the unmissable 160-foot high statue of Buddha that looks out onto the fjord-like inlet and to the Pacific Ocean beyond. Here, we climbed the eleven flights of stairs to the top of the Buddha’s head (fitting for an introspective moment) for a panoramic view of area. 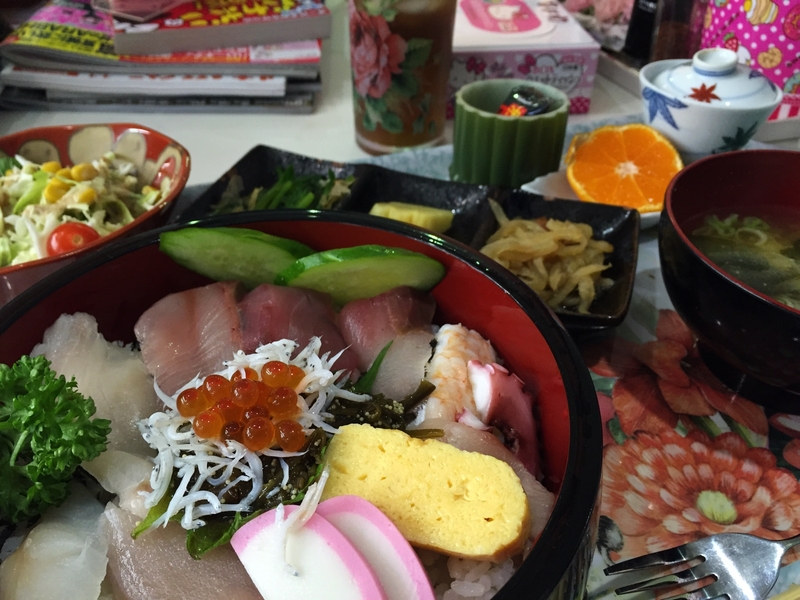 Our hosts wanted to finish the trip off with a farewell dinner (and, of course, plenty of sake), and they decided to treat us to dinner at an old-style inn a short walk from the center of Morioka, Kumagai Ryokan. In a throwback to the travelers’ inns of past, this small B&B boasts traditional rooms strewn with tatami mats, a rock bath perfect for your evening onsen, a garden entrance, Karaage the house Shih Tzu, and a welcoming dining room with a 10-person bar and just enough tablespace to host our group. As salarymen wrapping up their day trickled in for an after-work drink and meal, we sat down to a multi-course meal including sashimi (of course), baked fish, karaage (Japanese fried chicken), and enough sake to make us temporarily forgot that we were leaving the next day. In classic Japanese fashion, gifts were exchanged (we took home a nice new set of wooden sake cups), and promises were made to come back again soon. The next morning we were to board the Shinkansen at nearby Morioka Station for the quick two-hour ride back to Tokyo, a world apart but only a short bullet train ride away. Uneager to end things too early, on the way home we noticed a large group of high school-age kids milling about a coffee shop with blood pouring from open wounds on their heads and others decked out in costumes of various Disney characters. This being the night before Halloween, this made sense, and we rudely barged in sans costume to take it all in. Without skipping a beat, the crowd of revelers engulfed us and began taking group pictures, excited to share their revelry with us, travelers little seen in their city.